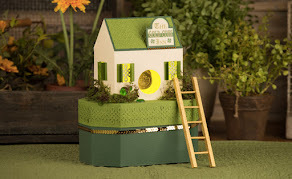 Brigit's Scraps "Where Scraps Become Treasures": Love - My Creative Time 48 Hour Flash Sale & Blog Hop! Love - My Creative Time 48 Hour Flash Sale & Blog Hop! 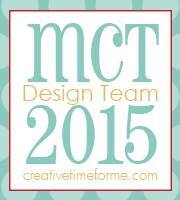 Good morning & welcome to another MCT "48 Hour Flash Sale Blog Hop!" Today we have a special FLASH sale going on because we have 2 new items that is available NOW for sale HERE! Since we just celebrated our 5 year anniversary, Emma thought..... "Why should we end the party now......right?" Don't forget to use the code FLASH at checkout to receive 20% off your ENTIRE (in-stock) purchase! Sale is happening NOW (Friday, Feb 5, 2016) & will end on Sunday, Feb 7, 2016 at 7am PST! These are both such fun sets to use!! For my first card I used the Stitched Hearts and popped up a couple of the smaller hearts from the set. The love die cut is from the Family Is Everything set. I used a piece of vellum over the patterned paper to mute the background so the love didn't get lost in it. The paper is by Crate from the Hello Love paper pad, I love this paper. This card was made in a couple of minutes, no measuring just eyeballed putting the stripes down, easy peasy!! I used the same love die as the card above and added a sentiment from the same set using the banner from the Vintage Stitched Label Dies. This little Sentiment Card was a happy mistake, I actually messed up on my plaid background and saved it by using for this heart cutout from the You Touched My Heart set instead. The love is also from that set and the littlier heart is from the Carved Heart set. The banner is one of the Trio Stitched Banners and for the stamped background I used the Build A Scripty stamp. 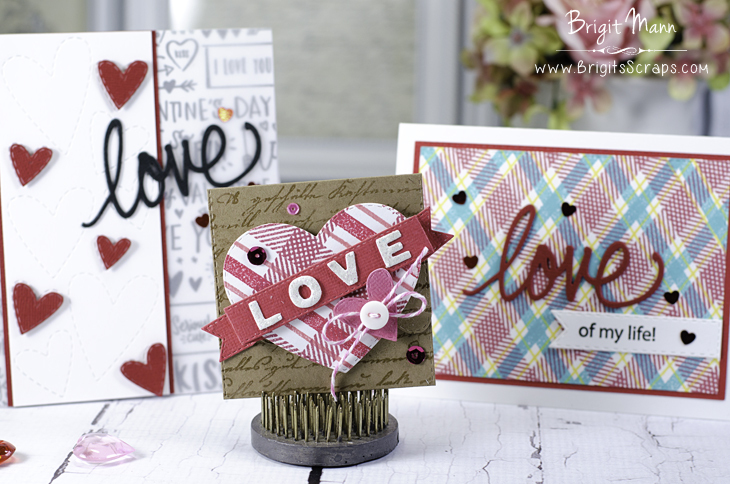 OH WOW Miss Brigit what Beautiful cards....I just loving what you created using these two new sets. Your embossed heart card is so sweet, Your Mad for plaid card is so fabulous and your Love card is so adorable. you so did 3 super outstanding creative jobs. YOU ROCK!! Oh my goodness, so many adorable Valentines. Beautiful showcase, Brigit. 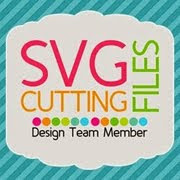 I love the samples you created! Beautiful! I just love your cards. The black, white and red one is my favorite! Love the surprise party and your beautiful products! You can never go wrong with a plaid builder... Love your sweet cards!! Wow, those are all beautiful cards! Love the new release. Wow, both of these are all amazing! FUN idea's and a great job on showcasing these sets! Awesome projects as always! Love the new plaid stamp! Lovely cards with these new products. Oh My! 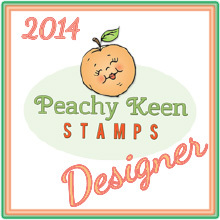 Your cards are beautiful and I love the idea of stamps to make our own plaids! You did a super job. Love your cards! 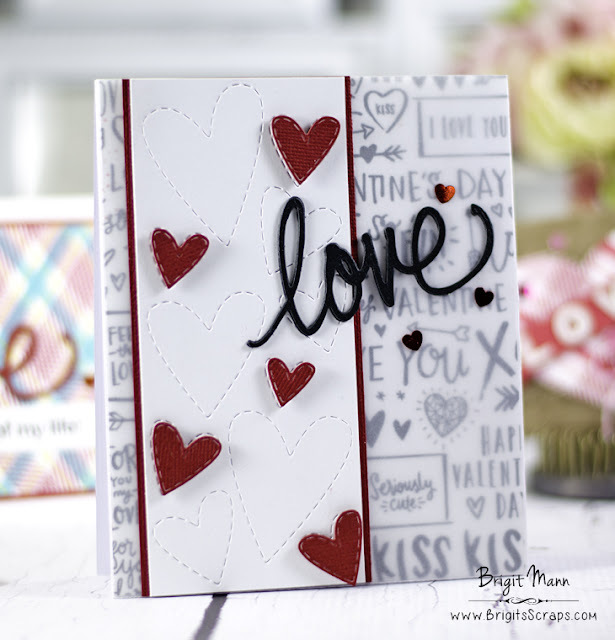 The vellum used on the first card...great idea and your sentiment card - mistake? wow, great recovery...love it! I really like both the stripes and the heart background, and you did a great job with them. Your cards are adorable, Brigit! I love each one of them! I think my favorite is the plaid heart against the craft scripty background - just adorable!!! A trio of delights, each one bringing a smile! 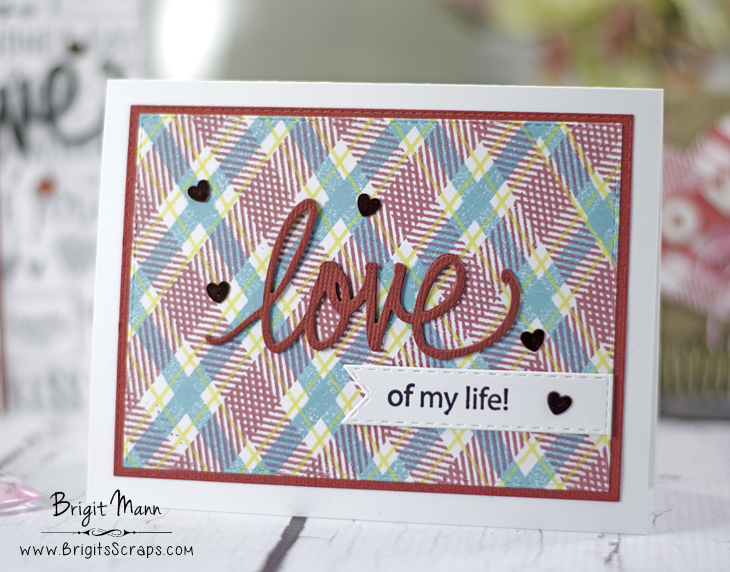 Love the plaid; 'happy mistake' for the heart is especially clever, and your love/hearts card is ever so lovely! You've made very clear that these sets are 'must haves'! Love your card samples, especially the pretty pink and turquoise plaid background! 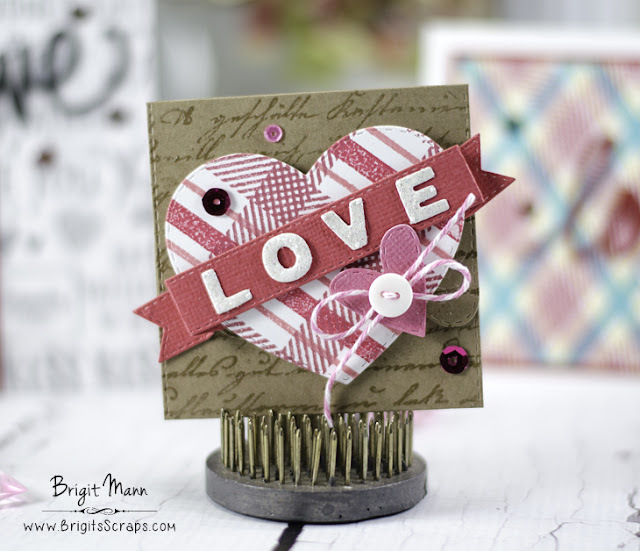 Love the way you used vellum, and the plaid card is so fresh and fun. You did a fabulous job with these new releases...just gorgeous! OMGosh I jus adore your sweet Valentine/love cards. Thanks so much for sharing.